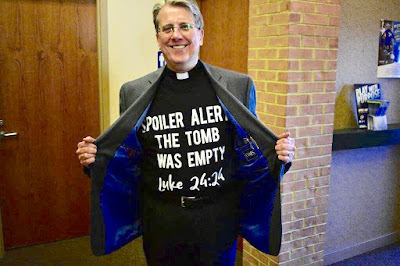 MarkDaniels.Blogspot.com: The Tomb Was Empty! When my colleague, Pastor Jody Becker, posted pics of shirts with this saying printed on them, I hurried to Amazon and ordered one. By the way, I invite you to read Luke 24:24 and consider this: The first people to whom the Easter message was first entrusted and the first ones to preach the Easter good news were women. Jesus is always turning the way this fallen world does things upside down. That’s because life in His kingdom is unconstrained by this world's sins and evil ways. He is the way to a life with God that lets all of us—female or male, Jew or Gentile, slave or free—become everything God intends for us to be, children of God made over in the image of Christ through faith in Christ. Be sure to celebrate all the special days of Holy Week this week!